When my oldest was a toddler, he attended day care full time while I worked. 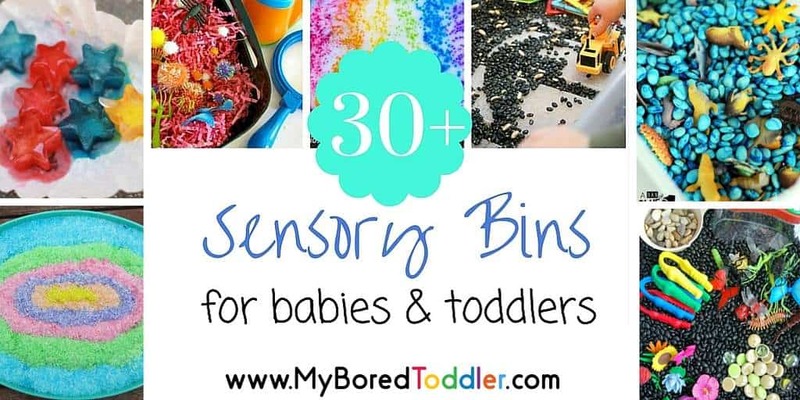 They had great sensory tables that they changed frequently, aligning the contents with whatever theme the curriculum was currently focusing on. 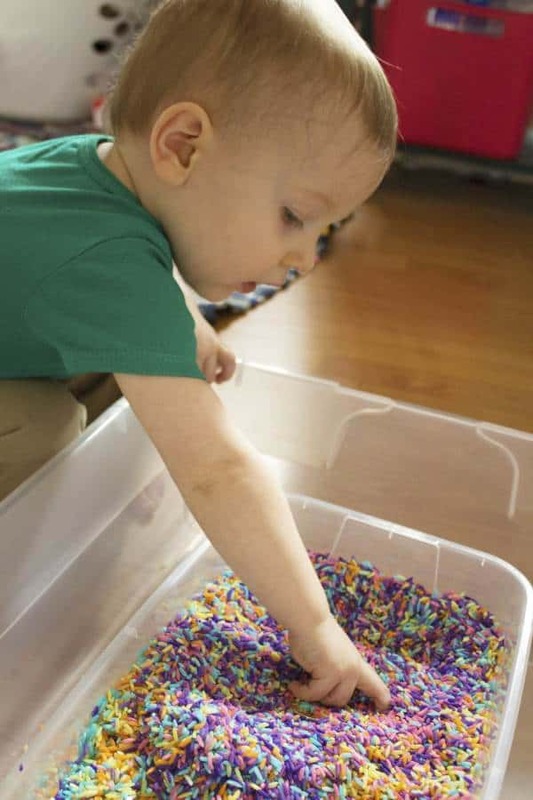 Although we would finger paint or play in the sandbox at home, I never needed to add in sensory play for him because he had plenty of it during the day. For my youngest, who just turned 18 months old, I’m a stay at home mom, so those opportunities aren’t there for him unless I create them myself. 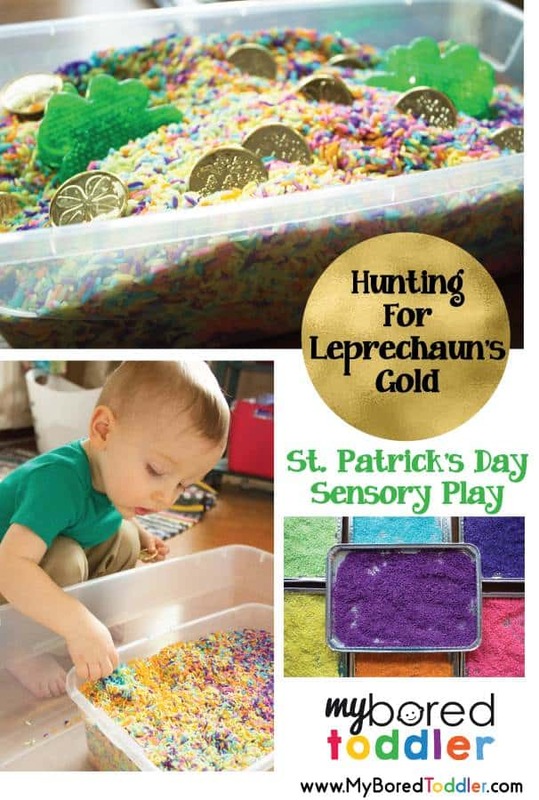 Looking ahead to St. Patrick’s Day, I was inspired to create a fun sensory activity for my youngest to participate in. (Although I will admit, when his older brother got a look at it, he wanted to play too!) 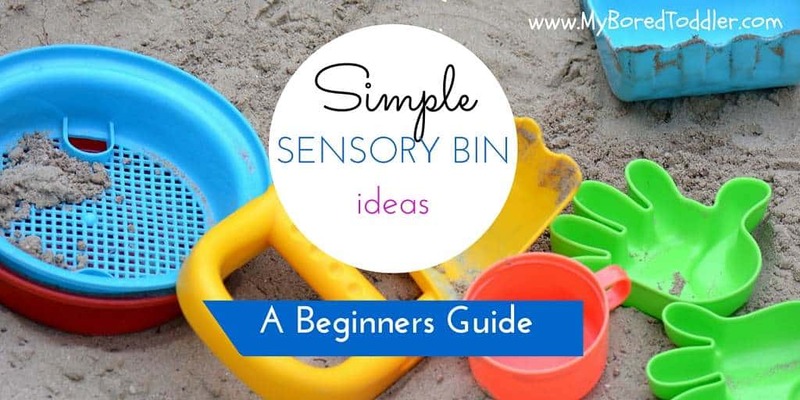 This sensory bin is inexpensive to prepare, with the majority of ingredients already in your home, or available at your local dollar store. It’s also extremely simple to execute, as long as you start about a day ahead of your anticipated sensory play. Bin or bucket to play in. Size is up to you (these ones are good). I kept it small this time, not wanting to give my little one TOO much rice to potentially scatter throughout my house! Dry rice. The amount you need will vary based on the size container you choose. Rubbing alcohol. Again, amount will vary based on size of container and amount of rice. Large zipper seal plastic bags. 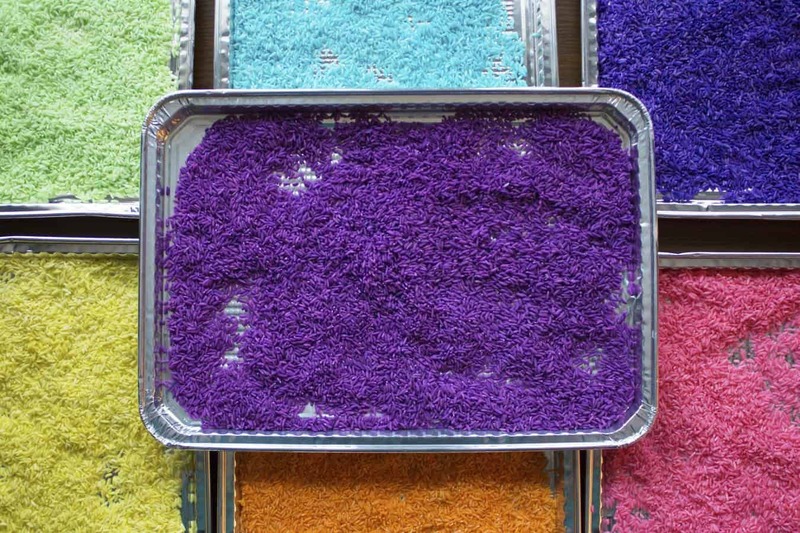 One for each color you are dyeing your rice. Food coloring. At minimum, you need the primary colors (red, yellow, blue) and then you can mix up other colors from them. If you have a bigger set of colors, like I did, this step will just be a little simpler for you. I picked up some disposable baking sheets at my local dollar store (2 for $1 is a bargain!). You can also use the cookie sheets you already own if you prefer. Plastic ‘gold’ coins. Other trinkets or treasures like these foam shamrocks are optional, but do make it extra fun! Paper towels/newspaper. Or old rags/fabric. These are optional. I wanted to make sure my bags didn’t leak food color anywhere so I lined my trays with them, but if you’re brave, feel free to skip this step! After I had assembled all my supplies, I started by setting up the bags. I needed 7 in order to dye rice in all the colors of the rainbow (red, orange, yellow, green, blue, indigo, and violet). 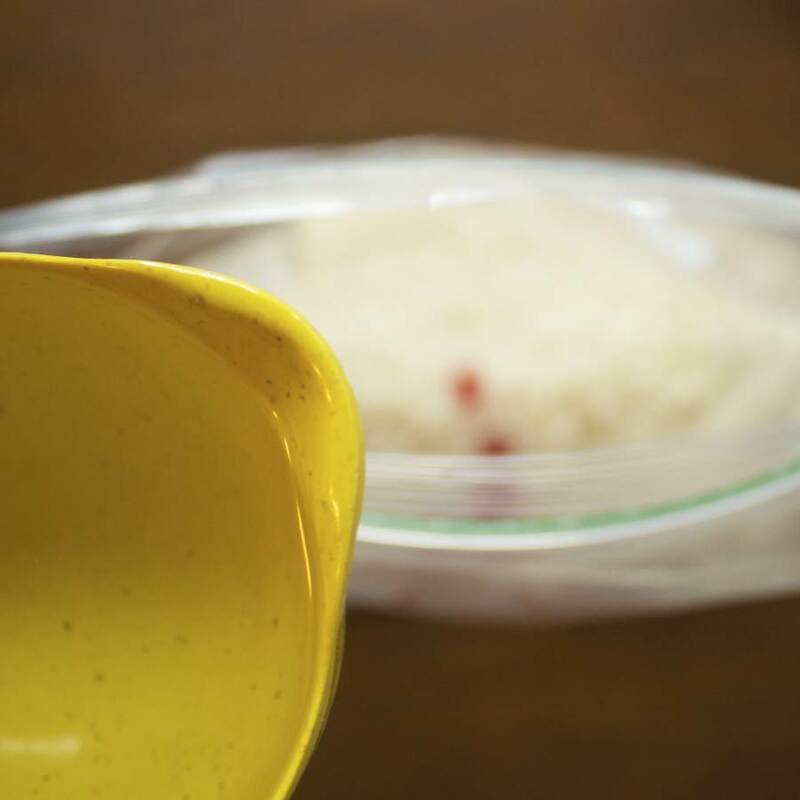 I measured about 1 ¾ cups rice and poured it into each bag. 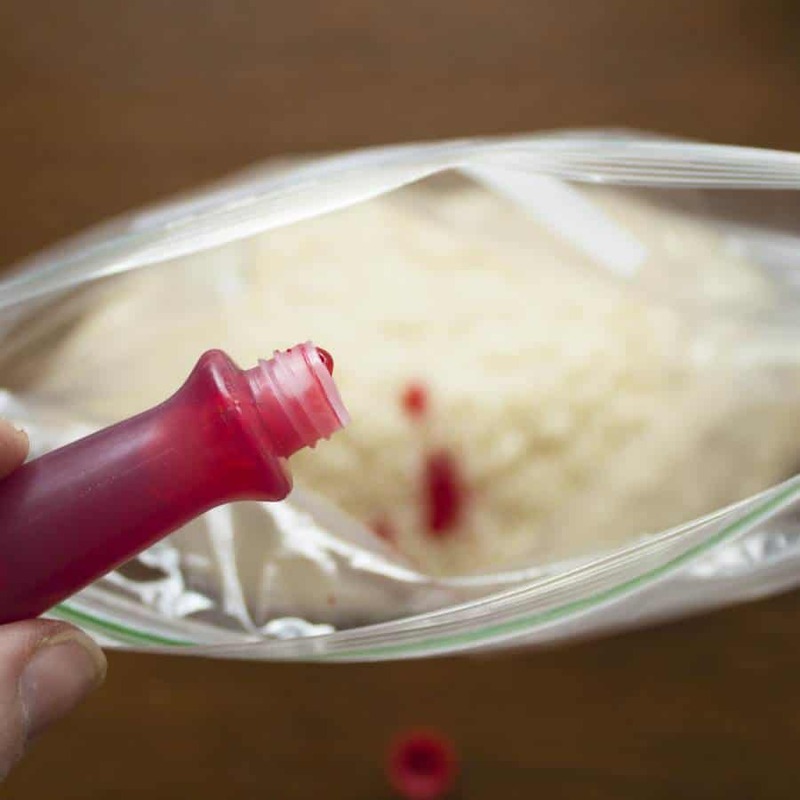 I added approximately 20 drops of food coloring to a bag, and then poured in ½ cup of vinegar. I sealed the bag up tight, and gave it a little shake and knead to work the dye and vinegar together, and to ensure all the rice was covered. I laid the bag out flat on a lined tray, and repeated the steps for each color I needed to dye. I let the bags sit for several hours, to give the dye some time to absorb. I flipped them over every 30-45 minutes or so, to be sure the rice dyed as evenly as possible. After 3 or 4 hours, I emptied the rice onto the trays, and allowed it to dry overnight. 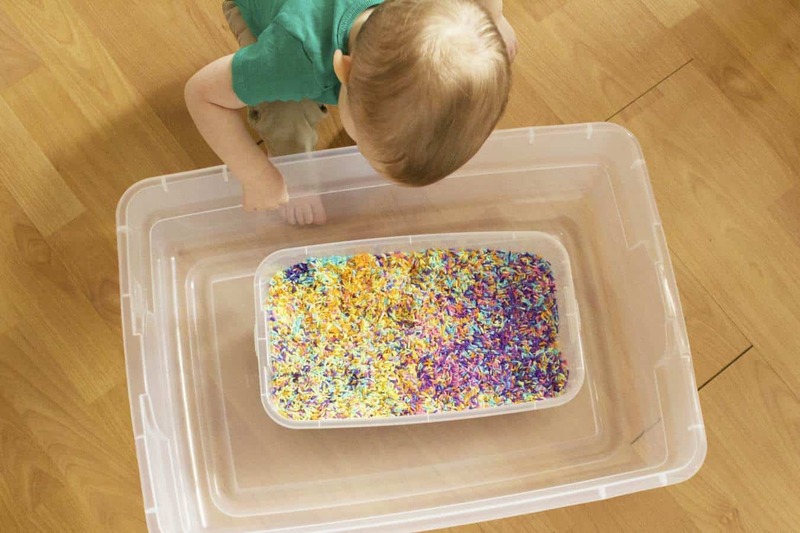 When all the rice was totally dry, I put it into our sensory bin and mixed all the colors together. I hid several ‘gold’ coins inside the rainbow rice, as well as some light-up shamrocks I found at the dollar store. (They were originally part of a necklace, but I thought they would be something fun for my toddler to look for). We gave my little one some time to dig around, explore, and play. You can incorporate kitchen utensils such as slotted spoons for extra fun. 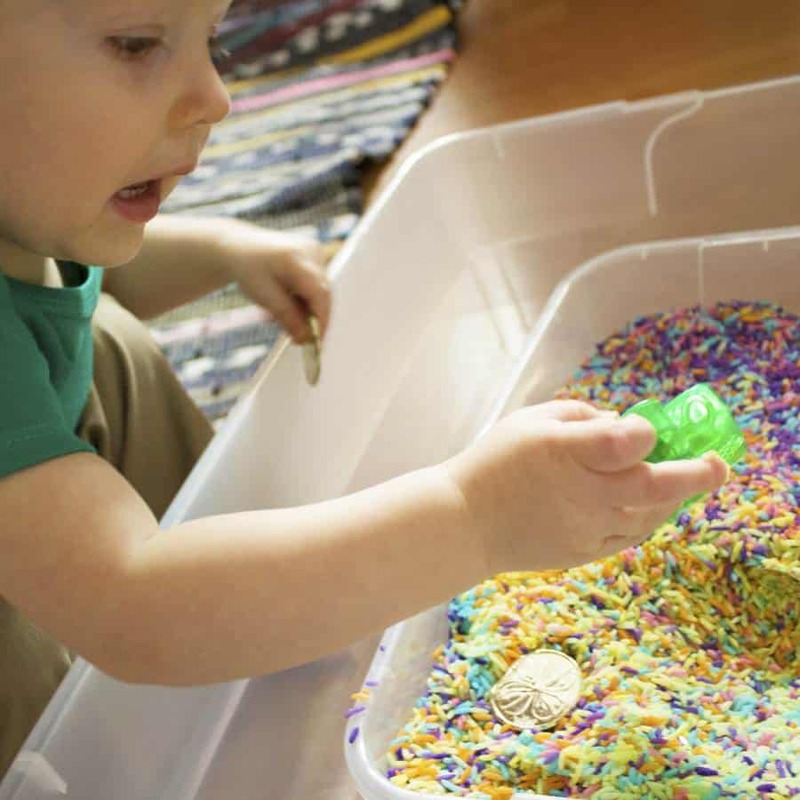 I hope you enjoy digging through the rainbow for gold and other treasures with your little ones! Kate is a former fashion designer turned semi-reluctant stay-at-home-mama. She enjoys using her design background to encourage a lifelong love of learning and literacy in her sons. Visit her at Homebound But Hopeful to stay up to date on craft and learning activities inspired by popular children’s books. You can follow Kate on Instagram, Twitter, Facebook and Pinterest.